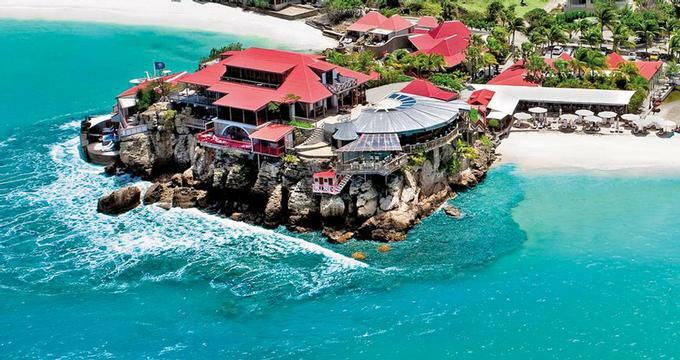 The attention to detail at Eden Rock – St Barths is impressive. From custom furnishings and unique layouts to the hotel's own organic herb garden and an art gallery, this getaway offers an experience unlike any other. To top it all off, the sandy shore in front of the hotel provides the perfect island escape with its soothing waves, coral reef, ocean breezes and beautiful views. Even if you are not staying at the hotel, a dinner at one of the restaurants combined with a tour of the art gallery, is a great romantic vacation idea. The menu was created by the world famous Chef Jean-Georges featuring French cuisine with Asian and International influences. Each of the 34 rooms, suites, cottages and villas features unique decor and offers high-end amenities such as flat screen TVs, iPod docking stations and Bulgari products. Choose from a location right on the Caribbean sea or on top of the rock. Villa Rockstar measures 16,000 square feet in size, complete with its own gate, private beach access, a fountain courtyard and cloisters. The villa has its own fully equipped gym, two cabins, a pool, a walled garden and a custom kitchen. If you don't need that much space, one-bedroom Cottages are just as stylish, luxurious and much more affordable. Rates start at Euro 465. You may also like: Hotel Guanahani, Hotel Christopher and tropical getaways.